A lumbar facet injection can relieve lower back pain. In fact, lumbar facet injections provide some of the leading treatments your NYC sports medicine team offers. A lumbar, cervical and thoracic facet joint injections are designed to reduce inflammation and pain in those tender areas of your back that get regular workouts. A cervical facet joint injection reduces neck pain, so if you work at a computer, a cervical facet injection or cervical facet block injections ease the discomfort of poor posture and improper ergonomics. Make an appointment in our New York pain management clinic to get your back pain evaluation and relief. Your spine is strong and flexible. Back pain occurs when your spine is damaged or diseased. Your Midtown Manhattan sports medicine and pain management doctor offers injections that can provide dramatic pain relief. Whether you need a thoracic joint injection or lumbar facet injections, the team at the Sports and Pain Institute of NY can help. Facet joints are made of cartilage and are responsible for your flexibility and ability to bend and twist. Your nerves pass through them to go to other parts of your body. Facet joint syndrome is the leading cause of back pain because the joints are almost constantly in use. Athletes are especially prone to facet joint problems by placing an inordinate amount of pressure on their backs as they twist, turn and move their heads. 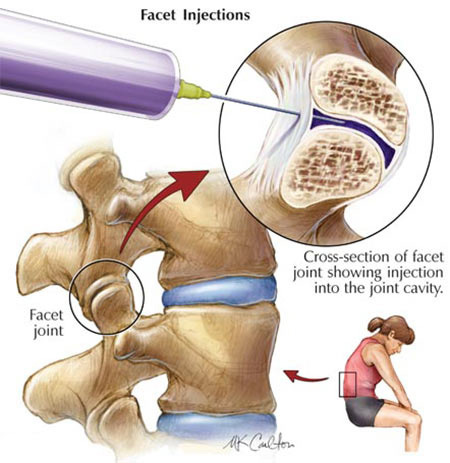 Why Spinal Facet Joint Injections? When giving a facet joint injection, your doctor uses x-ray imagery to inject the joint with a medication consisting of an anesthetic numbing agent and anti-inflammatory steroids. This procedure relieves pain caused by the facet joint. Some of the most common places your NYC doctor treats facet joint pain are in the neck and the lower back. Facet pain in the neck, head and shoulders may require a cervical facet joint injection. Upper back and chest pain caused by facets in the upper spine are treated with a thoracic facet injection. Lower back, hip, and gluteal pain from facets indicate treatment with a lumbar facet joint injection. A lumbar facet injection, cervical facet joint injection and thoracic facet injection are outpatient procedures normally done without anesthesia. The actual injections take only minutes. Overall, the procedure may last 15 to 30 minutes. While you lie on an x-ray table, your Midtown Manhattan sports medicine doctor disinfects and numbs the target area. Using x-ray imagery for guidance, he inserts a small needle into the painful joint. A tiny amount of contrast dye is released to guarantee correct needle placement. Once confirmed, the medication is released into the joint. Relief should be immediate because of the anesthetic. Two to five days later, you should experience even longer-lasting pain relief as the anti-inflammatory agent kicks in. You can expect to see a significant reduction of your pain within two weeks at most. Whether you receive a lumbar facet injection, a thoracic facet injection or a cervical facet injection, the results are powerful if the facet joints are the source of your pain. If the pain is not corrected by the facet injections, they do provide further diagnostic information critical to locating the real source of your pain. Most people agree the slight risks are worth it for the relief from constant pain. Talk to your New York City physician about your odds of making a full recovery after receiving cervical facet injections. Pain relief may last for as long as six months, which gives your body time to heal. Rest and activity modification, compounded by pain relief, often can be the best treatment, helping you avoid surgical options. After your cervical facet injection is complete, you’ll rest for 20 to 30 minutes in a recovery area. Then your doctor gently guides you through movements that would normally trigger your pain. The movements your doctor has you go through are designed to determine if your facet joints really were the source of your pain. You need an expert diagnosis to get the best results. That’s what you receive at the Sports and Pain Institute of NY. Your medical team solves your pain problems. They get you out of pain and back in the game. The cervical facet block injections and the lumbar facet joint injection are the gold standard for properly diagnosing facet joints as the source of your spinal pain, while giving you a reprieve from a life of pain and limited mobility. Do you have any questions about the spinal facet injections for back pain we offer in NYC? 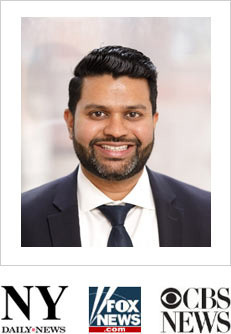 Would you like to schedule an appointment with the best rated back pain management doctor Febin Melepura MD of sports pain management clinic in New York? Please contact our office for consultation with the back pain relief specialist in Midtown Manhattan.